My colleague Jonathan Cohn has the goods in explaining why Mitt Romney’s new attempt to drive a wedge between Barack Obama and the more centrist Democrats nostalgic for Bill Clinton fails as a matter of policy reality. But it’s also worth noting, with only a smidgen of facetiousness, why it actually makes some sense for Romney to praise Bill Clinton, apart from the blatant political gamesmanship at work. 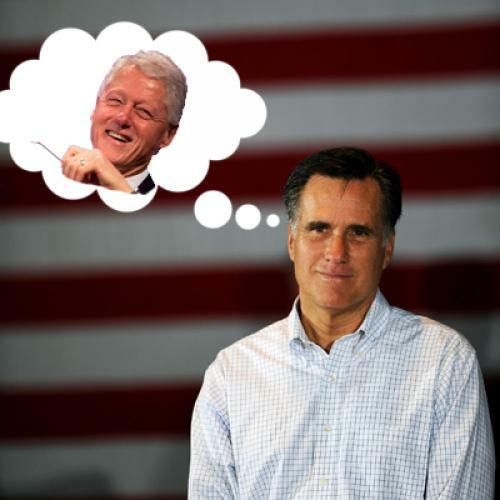 First, consider that when Bill Clinton was president, Mitt Romney was...kinda liberal! Heck, he even voted for Clinton’s rival Paul Tsongas in the 1992 Massachusetts Democratic primary! When Clinton was facing the Gingrich Revolution in 1994, Romney was explicitly distancing himself from Gingrich in his own race against Ted Kennedy, disavowing Ronald Reagan and declaring himself more pro-gay than Teddy. In other words, it’s no great stretch for Romney to put himself on the same page as Clinton, because back when Clinton was president, Romney kinda was...on the same page as Clinton. Now, it’s true that Romney has repositioned himself just a wee bit since then, which makes today’s remarks seem questionable. But really, maybe Mitt’s just on a kind of stroll down memory lane, back into his days as a proud Massachusetts moderate. But here’s the other thing: Mitt Romney also has reason to praise Bill Clinton because Clinton was...very good for Mitt Romney. It was Clinton who, over the objections of congressional Democrats, lowered the tax rate for capital gains and dividends, which under Reagan’s 1986 tax reform has been equalized with the rates for regular income. After congressional Democrats managed for several years to resist George H.W. Bush’s attempts to lower the capital gains rate, Clinton in 1997 traded away the lower capital gains rates, cutting them from 28 percent to 20, in exchange for an expansion of children’s health coverage or (as some accounts have it) college tax-credits for the middle class. George W. Bush subsequently lowered the capital gains rate even further, to 15 percent, which was not so hard once his Democratic predecessor had already gotten that ball rolling. And lo, that is why Romney now pays a tax rate of 13.9 percent on his millions, which are almost exclusively capital gains or “carried interest” from his Bain Capital partnership that is taxed as capital gains. So give Mitt a break on this one—he may be half sincere in praising the Big Dog. The Big Dog done Mitt good.